Mail4Rosey: Personalized Peppa Pig Book by Penwizard _ 8 Winners! 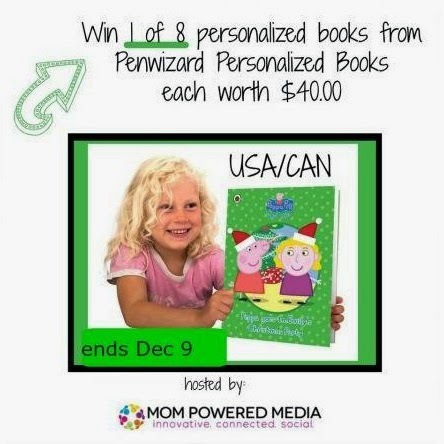 Personalized Peppa Pig Book by Penwizard _ 8 Winners! Do you know Peppa Pig?? I love to watch it just to hear the accents alone!! Now you can enjoy the characters from the much-loved TV show in a personalized book your child gets to call his/her own! Keep reading to learn more about the book, and the giveaway in the message from the sponsor below. Personalized books are great for getting kids involved in reading. You Can choose from our range of children's books and see your child in the pictures and story of their very own book. Penwizard is an amazing company. They offer a wide variety of books for both little boys and girls. The nice thing about their books is that you can literally customize the books to fit whatever your child looks like AND put in their name! These books are so easy to create and order. They are also pretty reasonably priced. They range in the 14.99 to 19.99 UK (so about 30-40$ Canadian). Considering your child is going to be able to have that book for the rest of their lives that's a pretty good deal! My great grandbaby Audi would love this. Yes she would. A personalized book with Peppa Pig is all kinds of awesome. I want to get one for each of my nieces!! I would love to the personalized Christmas book for my kids! I love Peppa! She is the cutest pig, I love when they let me give away her DVD's! My daughter used to love Peppa the Pig when she was younger.What a neat book! Super cute. My littlest love Peppa the Pig so I bet this would be a hit with her. My daughter loves Peppa Pig. We just read Muddy Puddles before she went to bed! I've never seen one where you could customize how the characters look. That is neat! That is such a cute gift idea. My aunt got my daughter a personalized book for her first Christmas. We loved it! This would make a great gift! Peppa the Pig is adorable! Oh wow. How cool is this?! My son loves Peppa Pig, and he'd really enjoy a personalized book. These are the BEST gift! My son loves to see his name in print. Fantastic gift idea. This would make anyone smile. This is such a great gift idea. I love personalized books. My kids had a few when they were younger. My kids were just watching Peppa Pig today. They would love this! I love the Peppa Pig book called "My Daddy" My son would love to have this for him and his dada. This sounds like a good book! Great giveaway too! My kids never really knew about Peppa Pig. What a great giveaway.